Deshaun Watson: "I'm aiming for 50+ touchdowns in 2018"
Who is more likely to replicate rookie form in 2018 Dak Prescott or Deshaun Watson? 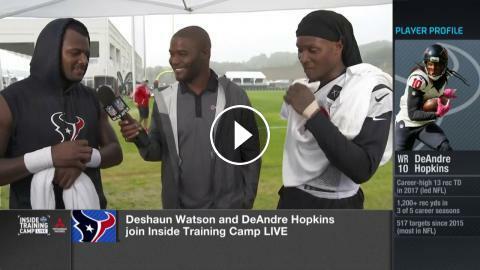 DeAndre Hopkins: "It gives me chills to think about the numbers Deshaun Watson & I put up last year"
Texans WR DeAndre Hopkins on Deshaun Watson: "I expect us to be the best duo in the NFL"
Which returning QB means more to his team - Andrew Luck or Deshaun Watson? How tough is Houston Texans QB Deshaun Watson? Is Andre Johnson's assessment of Houston Texans WR DeAndre Hopkins as the NFL's best WR right? Deshaun Watson on Santa Fe shooting victims "We're going to continue help them as much as we can"
How will the addition of Texans WR Demaryius Thomas help DeAndre Hopkins? What to expect from Deshaun Watson & Andrew Luck next season? Who is this year's Deshaun Watson? How will Deshaun Watson's come back going to look like? Will Deshaun Watson have a bigger season than Carson Wentz in 2018?